While it is a bit complicated getting the photographic equipment assembled, tested, and reliable, the true challenge is handling the liquids. It seems that everything in the world affects how they behave: viscosity, surface tension, density, temperature, the shape of the dropper, and what the cat had for dinner. Learning to control these variables is what demands the patience and creativity. I use myriad arrangements to create the shapes: sometimes carefully placed beads of liquid on a flat surface, sometimes drops in free-fall, sometimes drops landing on a dry, flat surface, sometimes splashes of drops into a pool or with other drops, and sometimes multiple drops or splashes. And there are many things to be done with altering the physical properties of the liquids. I increase the viscosity with glycerin (because it doesn’t affect the surface tension much) I use dishwasher rinse aid to reduce the surface tension (because it doesn’t create bubbles, like soap does). Someone recently suggested Kodak Photo-Flo, instead, and it looks like a good choice. Food coloring works pretty well to add color. Aniline dyes are richer, but they affect the surface tension more than food coloring. Propelled by the vicious cycle of serendipity and curiosity, I keep coming up with new things to try. And other people have plenty of ideas. The most intriguing so far has been the suggestion to try a high concentration of DNA in water. That would have never crossed my mind. But really appriciate your tips here.. i believe i can do it one day. Thanks alots for sharing your valueable tips here. might be interesting to do this: have a nonpolymerized liquid that your drop polymerizing reagent into.. or the other way around. Congratulations on your work. I am associated with a community of skilled artists. The photographers instantly recoginzed your work to be defined as photography, but a few of us realize that your work is sculptural as you manipulate the media of liquid form. One of my associates recognized your work to be sculpturally transient in it’s nature as Andy Goldsworthy. Your sculptures, although imbued with an uncontrollable random factor, have life spans in milliseconds not unlike those of Goldsworthy, http://www.sculpture.org.uk/artists/AndyGoldsworthy , whose sculptures have duration of minutes sometimes. Again, congratulations on beautiful work. You have given us a new perspective on sculpture. Much appreciated. Thanks for the thoughtful comment. I appreciate your observation about the sculptural aspects of my images. That gets past many people. And, I am a bit humbled by the comparison with Andy Goldsworthy, but there is a certain parallel: we both manipulate nature somewhat purposefully, and take pictures of it. My work is more ephemeral (and at times less predictable), so it requires a different photographic technique, but in many ways, not a particularly inventive one (nods to Worthington and Edgerton). I am a senior in high school and am in an Independent Study in photography. I chose highspeed Flashed Photography, your work is an inspiration and I would love to model my work after yours. Thank you for having this online and for being amazing! The lighting, as in all photography, is paramount. I recommend the book, â€œLight: Science and Magic: An Introduction to Photographic Lighting,â€ particularly the chapter on glass since the optical issues are very similar to water. It is a technical endeavor, and requires some special equipment to satisfy the arcane needs of the subject. There are some commercial products available, though. See http://www.bmumford.com and http://www.woodselec.com. You should also wander around http://www.hiviz.com as it provides some good background information. 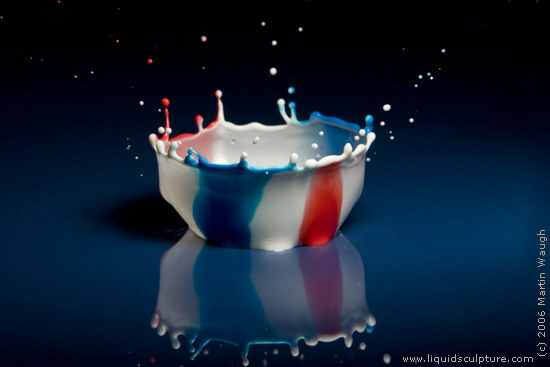 I place beads of food coloring and cream on a flat surface and then drop a drop of cream onto them. As the splash forms, it carries the coloring up with it. I am a student of fluids ,and it’s amazing for me to find the interesting behavior of the liquids.Thanks to the hightech and the proficient works of people like you. Thanks. I love seeing what liquids will do and sharing the results. I just got started with high speed flash photgraphy. I am using Hiviz’s kits, photogate and sound triggers with delay. They are easy to build, and I got immediate results both for popping balloons and liquid drops. But as for photographs, they stink. I immediatly discovered the type of liquid makes a big difference. I have tried water (too transparent and not viscous enough) and glycerine with food coloring (too viscous and the food coloring does not dissolve but forms droplets of color in the glycerine}. What proportions of dishwasher rinse do you use with what liquids, or what proportion of glycerine with what liquids? And what does the size of the drops have to do with the results? I am using a syringe from the drug store. which has an opening of about 1/16th inch. Your help will get me quicker to the point where I am making photographs. Thank you. The internet is a remarkable resource. I have been addicted to shooting water. For some reasons, I am more patience when shooting water than other subjects. I have posted some on my website. So far, I have try just water, food colors, as well as milk, mix and match kind of thing. Any tips of flashing angle? I have only one flash unit? Any advise? Also, if you can give me more ideas to try, i certainly appreciate it. I have some of my work posted on the site. Thank you! I’ve started doing water droplets as part of my photorgaphy course work shine and as a student I need a bit of advice on how to advance with the technical things with how to time the water droplet with out all the equitment. As well what other things I could try out that are simple but still quite impressive. At the moment I’m looking at a variety of photographer including yourself as part of my artist analyse. It would be great if you could help with some advice and information. You’ve got a fun journey ahead! It is possible to take a number of fascinating water drop shots without specialized equipment (it’s just requires more patience). Irene Muller has had great success with using a keen eye and quick finger for timing. As with all photography, getting the lighting right is the most important part. And that can be practiced by using clear glass objects as a stand-in for fleeting water drops. Take pictures and experiment with the compliant subject first, then apply what you learn to moving water. Capturing a splash that has formed a column (or “spike”) is fairly easy since it is moving fairly slowly at that point. Many times you will get a nice ball on top of it, and you can use that ball as a lens to focus the background (like the “world in a drop” images that several people do). Some tips that might help: Use back-lighting. Use an off-camera flash to illuminate a backdrop or to shine through a diffuser toward the camera. Corrie White has now released an ebook on water drop photography. The ultimate guide to water drop photography.